Note: This is a translation of the interview, which was originally in Arabic. If anyone wants to read the original, drop me an e-mail. 1. How did you get into modelling for the magazine? I originally worked in a tourism agency, and the modelling job came about by chance. I saw several magazines about the hijab, and I wanted to communicate to them the idea that there is fashion for women who wear the hijab, and chic clothes and hijab styles which are also respectable. So I applied and alhamdulilah, I was accepted and became a hijab model! 2. Whats the best thing about this job? The best thing? I love getting my photos done, creating new hijab styles and making regular clothes hijab friendly - within the boundaries of modesty. It comes out really beautiful and that way we can make people like the hijab - we show them that the hijab can be chic and makes us more beautiful, not ugly. I'm learning new things every day. 3. And the most difficult thing? Honestly I don't know what to say to that question, but I really hope that we are able to get our message across correctly, and that no one takes it the wrong way and ruins the image that we are trying to get across to the world. 4. What are your favourite hijab fashion trends these days? In my opinion there is no such thing as trends. The things that suit me are my trends. Personally, I love spring colours like pistachio and fuchsia - the colours of life and colours that I think really affect your mood. The most important thing is that it conforms to hijab - not tight clothing which we then go on to call a 'trend', that's not right. 5. What message are you trying to get across in the way you dress? The message I'd like to get across to the whole world is that we are Muslim girls and we wear hijab. We are not terrorists - the opposite is true. I want to tell them that I am a hijabi and a practicing Muslimah, I pray, I work, I go out, and life goes on. The hijab is never a barrier in my life, and the way we treat people is the most important thing. For example, through my work in tourism I got to interact with many foreigners, and they are happy with me and my hijab. Some of them even asked me to show them a few hijab styles! What do you think of Yasmin's outlook? "We are not terrorists - the opposite is true. I want to tell them that I am a hijabi and a practicing Muslimah, I pray, I work, I go out, and life goes on. The hijab is never a barrier in my life, and the way we treat people is the most important thing." Speaking as a non-Muslim with Muslim friends (I found the blog through a friend's Facebook group and read it occasionally because, even though I'm not a hijabi, I prefer modest styles and really like what you show here), I can say that a LOT of the non-Islamic world--particularly those who know no Muslims, like older people--really needs to hear this message. I get suspicious looks just for saying that I'm friends with Muslims....Anyway, good for her and everyone else spreading the word! Thanks for the interview. I wish she can be more modest in her look (her neck is not covered, covering the neck is a condition in the Islamic hijab). 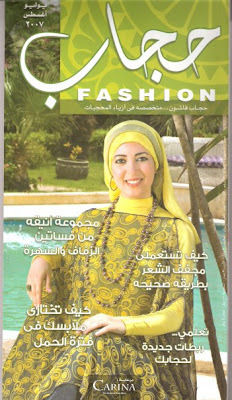 I think this magazine is Egyptian, I am not from Egypt but I have some friends from Egypt, they told me that most women there put a lot of makeup when going out and they wear clothes showing their belly. If it is true, women need then magazines that show them how to be beautiful and modest at the same time. Thanks for reding until here.